This bridge, built in 1957, carries Highway 101 over railroad tracks (and Sierra Point Parkway) in South San Francisco. It's a 10-span steel girder bridge, with girders supported by steel floor beams. One end of each girder is bolted to a floor beam stiffener, and the other end was originally attached to a rocker bearing on top of a short seat on the floor beam. The floor beams are supported by 2–4 nonductile reinforced concrete columns. Originally, steel bearings sat atop the columns and were welded to the floor beams. The columns are supported by under-reinforced spread footings on stiff clay. The bridge abutments are on a 60° skew parallel to the railroad tracks, but the bents have no skew. This interesting configuration results in some floor beams being supported by the abutments. The bridge site has a 0.4g PGA and is about 16 km from the Mw=8.0 San Andreas Fault. The weak columns and poorly reinforced footings leave the bridge vulnerable to the earthquakes that frequently strike the San Francisco Bay Area. However, the proximity of the railroad limited the retrofit options. Therefore, this bridge was retrofitted with isolation bearings in 1985, making it the first isolated bridge in the United States. All the bearings at the columns and at the abutments were replaced by lead/rubber bearings, which were designed so that the seismic forces would be less than the capacity of the columns and footings. These lead/rubber bearings are rectangular, but round lead/rubber bearings are now used in other bridges because they provide much better performance, particularly for bridges that must move in all directions. 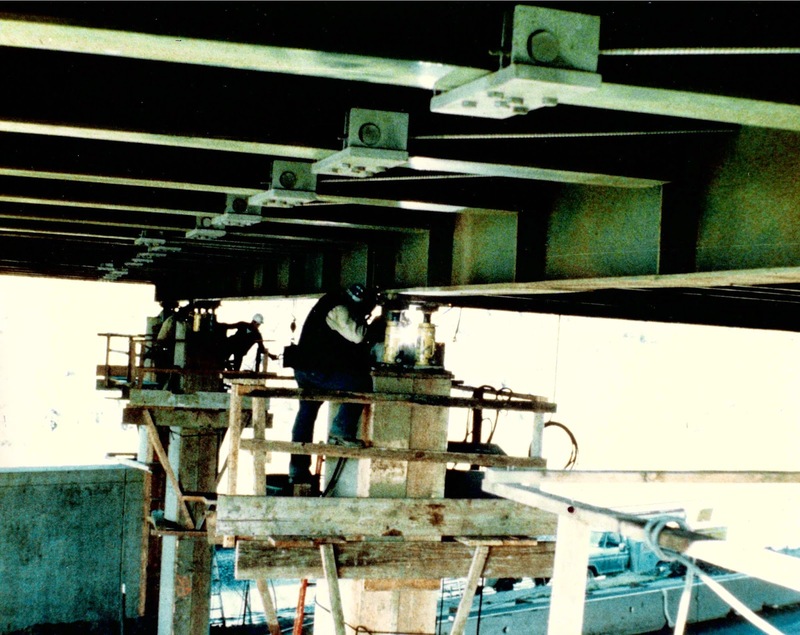 To prevent the rocker-supported end of the steel girders from becoming unseated, 2.2-cm steel tie rods were used to connect them to the bolted girders on the other side of the floor beams. After the retrofit, the bridge was instrumented with strong-motion accelerometers above and below the isolators. The epicenter of the 1989 Loma Prieta earthquake was about 100 km from the bridge site, and the measured acceleration at the bridge was 0.29g above the isolators and 0.31g below the isolators (parallel to the bridge). These two accelerations are about the same, which shows that the lead core did not yield during the earthquake and the bridge behaved elastically with no damage. San Mateo County, California Bridges: Sierra Point Overhead over Caltrain Tracks (2) by Mark Yashinsky is licensed under a Creative Commons Attribution-NonCommercial-NoDerivatives 4.0 International License.